splice: and there isn't anything Black can do. If Black tries a, b or c, is on the vital point and White plays d to make the circled eye false. Black at the circled point results in the same, minus the white play at d. Black d, white plays c and makes the circled eye false, and when Black connects, he is left with a dead shape. Dansc: Not that Black should connect after white c, of course. That would be dying in gote. byorgey: And, of course, after Black should not respond here at all. 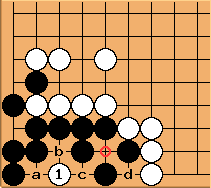 Rather, Black should save c or d as a ko threat.